This story is part of a series of blog posts marking the third anniversary of the court decision that sparked a statelessness crisis in the Dominican Republic. Despite all the accounts of adversity since the 2013 Dominican court ruling, some Dominicans of Haitian descent have successfully applied for documents, restored their nationality and enjoyed the benefits of citizenship—many with the help of organizations supported by AJWS. Some are defying the racism and discrimination that has long held them back and are making their country proud—like Luisito Pie, a taekwondo athlete who won the Dominican Republic’s only Olympic gold medal this summer. 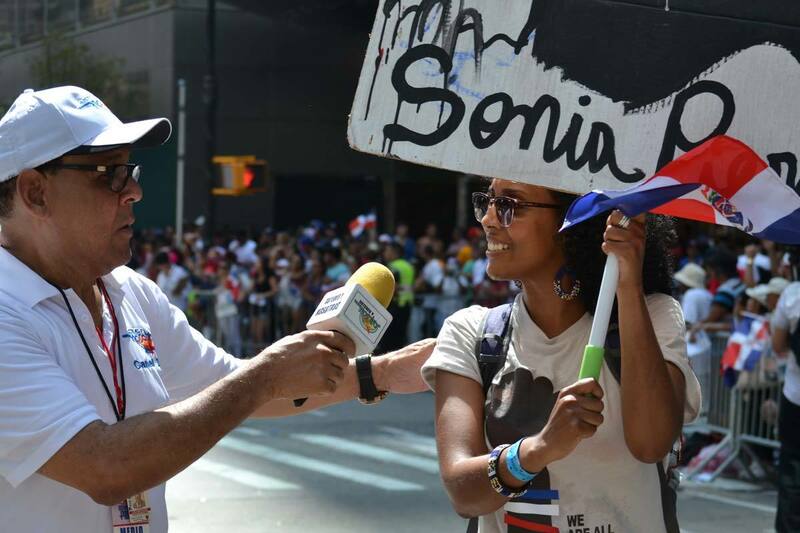 He celebrated this athletic and patriotic victory at a recent press conference hosted by AJWS grantee Dominican@s por Derecho, which generated widespread media coverage. AJWS’s network has spent years making tremendous shows of support for the people caught in the crisis. Our D.C. staff is slowly but surely making progress advocating with the U.S. government to express concern about the situation abroad. And the community organizations we fund—both in the Dominican Republic and here in the U.S.—have focused on intervening when citizens face expulsion or denial of their rights, and educating all Dominicans about the issues. 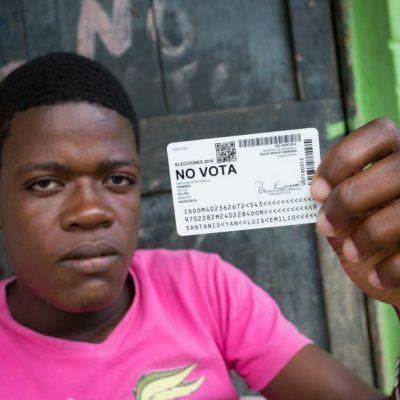 For example, more than 42,000 Dominicans of Haitian descent who were eligible to vote in May’s presidential and local elections were unable to do so because of bureaucratic snags preventing them from getting proper ID documents on time. Organizations we support abroad worked hard to clear the hurdles, supporting citizens as they navigated complex mazes of paperwork. American rabbis in AJWS’s 2015-2016 Global Justice Fellowship brought this issue to their members of Congress, and some members of Congress responded, urging the State Department to press the Dominican government for fair elections. In a sign of progress toward equality, some Dominicans of Haitian descent successfully restored their citizenship and exercised their right to vote. And some even ran for office. Dominican-based AJWS grantee Reconoci.do, a close partner of WAAD, played a major role in ensuring that people were able to vote and that the polls were fair. They created and issued a voter guide highlighting where candidates stand on issues of documentation and nationality. It also joined with another organization to train hundreds of Dominicans of Haitian descent to be “electoral observers” who look out for vote buying, fraud and denial. Several Dominicans of Haitian descent belonging to Reconoci.do ran for municipal office. One, Juan Telemin, voted for the first time—for himself. “This allows Reconoci.do to gauge how much we’ve grown in our fight and the new dimensions that we’ve created,” Ana Maria said. “It’s not just a matter of obtaining your documents, but also feeling empowered enough to run for political office.” While he didn’t win, Telemin’s race was a tremendous source of pride for his community. Thankfully, Reconoci.do’s observers found very few Dominicans of Haitian descent being turned away at the polls—but, Yanilda reiterated, the majority of the disenfranchisement happened before the elections. For Ana Maria Belique, Reconoci.do’s founder and coordinator, the elections were “bittersweet. 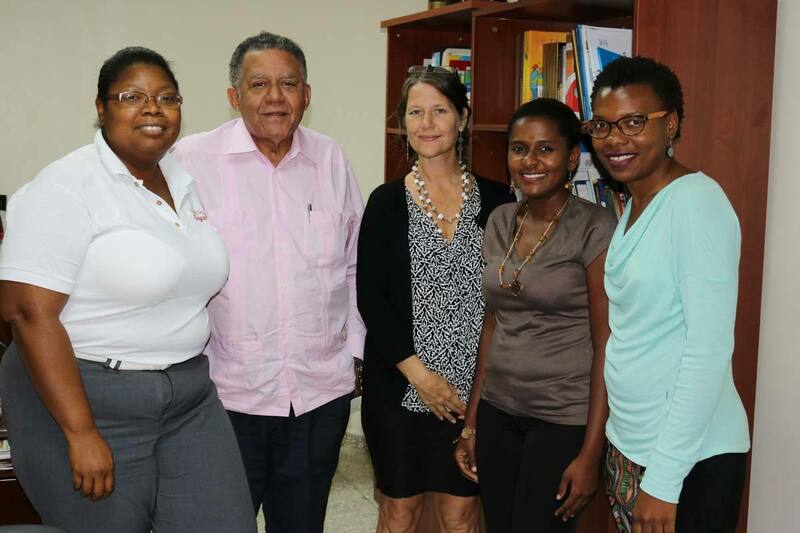 Dominican journalist Juan Bolivar Diaz, second from left, poses with AJWS grantees and staff, including Ana Maria Belique, far right, coordinator of Reconoci.do, and Amber Lynn Munger, AJWS Senior Program Officer, center. 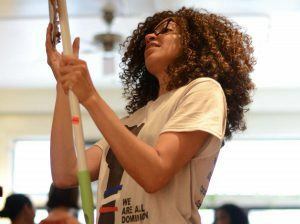 Diaz helps Dominican organizations develop their capacity to tell their stories to the media. Ana Maria said Dominicans of Haitian descent vote the way the majority of other Dominicans do—out of their own special interests—and that’s a problem. Reconoci.do will continue raising awareness among citizens about voting rights and casting votes wisely. “Our goal is not to fight for participation in the system as it exists, but to help develop a better citizen, someone who is empowered and educated,” Ana Maria said. Back in the U.S., AJWS has played a lead role—and made palpable progress—over the past year advocating for the U.S. government to respond to the Dominican statelessness crisis. For years, D.C.-based organizations have supported Dominicans of Haitian descent in their fights for equality and fair treatment—trying cases in the Inter-American Court of Human Rights and protesting expulsions or rights abuses. “But there were only a few organizations effectively engaging the U.S government,” said Ronnate Asirwatham, AJWS Senior Policy Advisor. In 2015, AJWS, a coalition of fellow faith-based groups and other advocacy organizations came together to push for U.S. engagement on the issue. We brought MUDHA, a Dominican organization we support, to D.C. to lobby House and Senate leaders. For many American officials, this meeting was the first time they heard directly from Dominican citizens on the issue. Subsequently, in August 2015, the Senate sent its first public letter to the State Department expressing concern about stateless people in the Dominican Republic. Then, the State Department made its own statement urging the Dominican government to respect the rights of all the people within its territory and avoid mass deportations. In the following months, the coalition was granted regular meetings with the State Department to pursue solutions to this crisis. 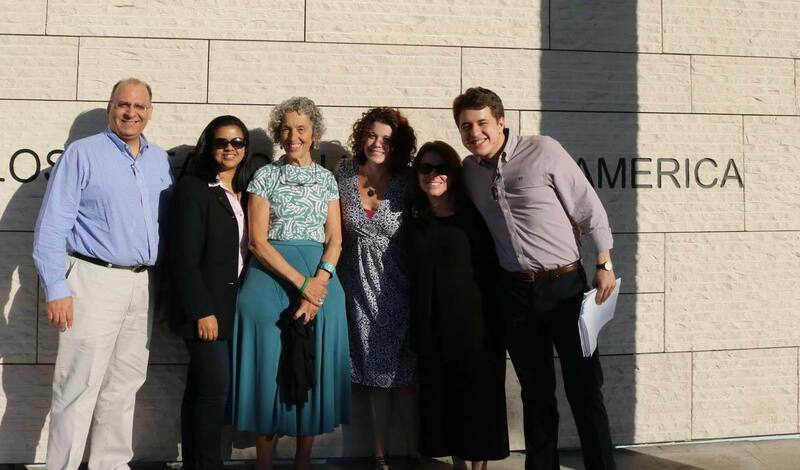 AJWS staff and American rabbis in our Global Justice Fellowship visit the U.S. Embassy in the Dominican Republic in January 2016 to plead for a just resolution to the citizenship crisis. Pictured are Luis Mena, former AJWS in-country consultant; Ronnate Asirwatham, AJWS Senior Policy Advisor; Ruth Messinger, AJWS Global Ambassador; Lilach Shafir, AJWS Director of International Education and Jewish Engagement; Larissa Siegel, AJWS Senior Development Officer; and Charley Kargman, AJWS Executive Assistant and Program Associate. Ronnate said the crisis won’t be solved until Dominicans of Haitian descent can obtain their citizenship just like any other Dominican—instead of having to navigate complex registration processes that are creating several different classes of citizens. And protection needs to be given to an emerging third group—those with proper documentation who are being denied birth certificates for their children by hospitals. “All of these bureaucratic hurdles must be removed,” Ronnate concluded. We support organizations that have been champions at raising awareness about citizenship issues and calling for change—both in the Dominican Republic and among the Dominican diaspora in the U.S.
AJWS grantees Movimiento de Mujeres Dominico Haitiana (MUDHA), Movimiento Social-Cultural de los Trabajadores Haitianos (MOSCTHA), and Red de Encuentro Dominico Haitiano-Jacques Viau (REDH-JV) have put pressure on the Dominican government to reverse the discriminatory ruling, helped families caught in the middle of the crisis with the legal paperwork they need to skirt deportation, and filed countless cases with the Inter-American Court of Human Rights. Jenny Moron, a legal adviser for MUDHA, boasts that her organization has resolved the situations of dozens of citizens and helped shine a national and international spotlight on important injustices. This summer, Le Groupe d’Appui aux Repatriés et Réfugiés (GARR) trained journalists, religious leaders and grassroots organizations from border communities to be savvy advocates for the rights of Dominicans of Haitian descent and Haitian migrants fleeing or being deported from the Dominican Republic. Reconoci.do has been pushing for awareness for the plight of these groups going all the way back to 2012. It has organized events ranging from flash mobs to street theater performances to protests on the 12th of each month. They’ve been arrested and gotten flak from the government and other Dominicans—but also managed to get their message into the public consciousness. “We’re so consistent with our manifestations that media outlets would reach out to us about messaging or the next gathering,” said Ana Maria Belique, Reconoci.do coordinator. “We began to gain more visibility and notoriety. 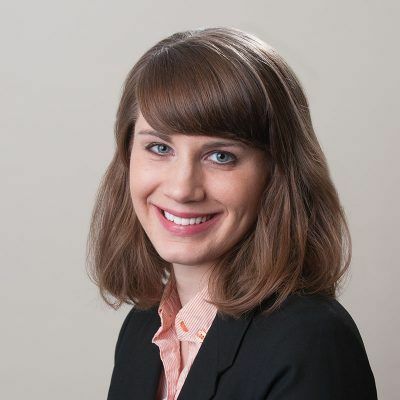 Even organizations not specifically doing citizenship work are standing in solidarity with those who are, signing petitions, participating in protests and recruiting the assistance of the experts when they come across people who need help getting identification cards or having their civil rights recognized. “Our strategic vision focuses on human rights, and immigration and citizenship issues are a logical extension of human rights,” said Alba Reyes, coordinator of Centro para la Educación y el Desarrollo (CEDUCA, “Center for Education and Development”), which works with youth and others in bateyes, barrios and rural communities to help them understand and exercise their rights to public services like jobs, education and medical care. 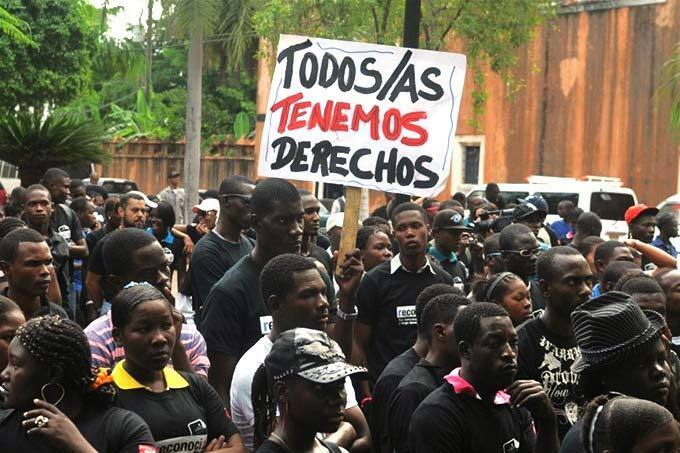 CEDUCA is a member of Dominican@s por Derecho, a network that brings together civil society organizations standing up for the rights of Dominicans of Haitian descent. New York-based We Are All Dominican (WAAD) is standing in solidarity from 1,500 miles away. Since 2013, the group of mostly Ph.D. candidates has held panel discussions in academic settings, performance art events at community centers, rallies and protests in front of the Dominican Consulate, advocacy days in Washington, D.C., and speak-outs on street corners in Washington Heights, a mostly Dominican neighborhood in Manhattan. 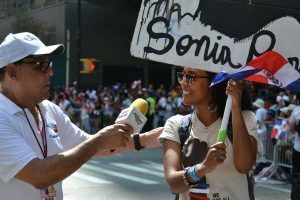 They’ve written countless open letters and blog posts, devised lesson plans and curriculums for youth educators and high-school teachers to use a documentary film about the citizenship crisis, and marched in New York’s famous Dominican Day Parade.